Most of us associate the holiday with happy Pilgrims and Indians sitting down to a big feast. And that did happen – once. The story began in 1614 when a band of English explorers sailed home to England with a ship full of Patuxet Indians bound for slavery. They left behind smallpox which virtually wiped out those who had escaped. By the time the Pilgrims arrived in Massachusetts Bay they found only one living Patuxet Indian, a man named Squanto who had survived slavery in England and knew their language. He taught them to grow corn and to fish, and negotiated a peace treaty between the Pilgrims and the Wampanoag Nation. At the end of their first year, the Pilgrims held a great feast honoring Squanto and the Wampanoags. But as word spread in England about the paradise to be found in the new world, religious zealots called Puritans began arriving by the boat load. 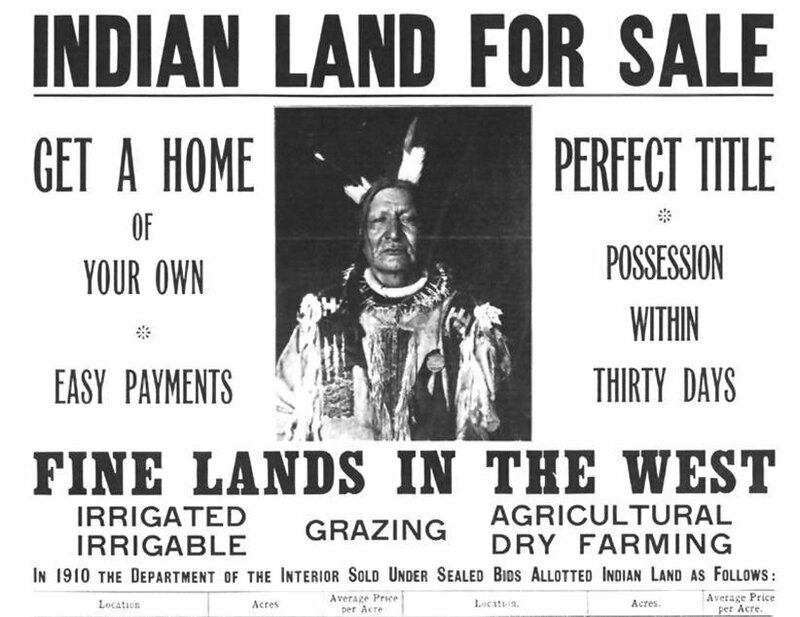 Finding no fences around the land, they considered it to be in the public domain. Joined by other British settlers, they seized land, capturing strong young Natives for slaves and killing the rest. 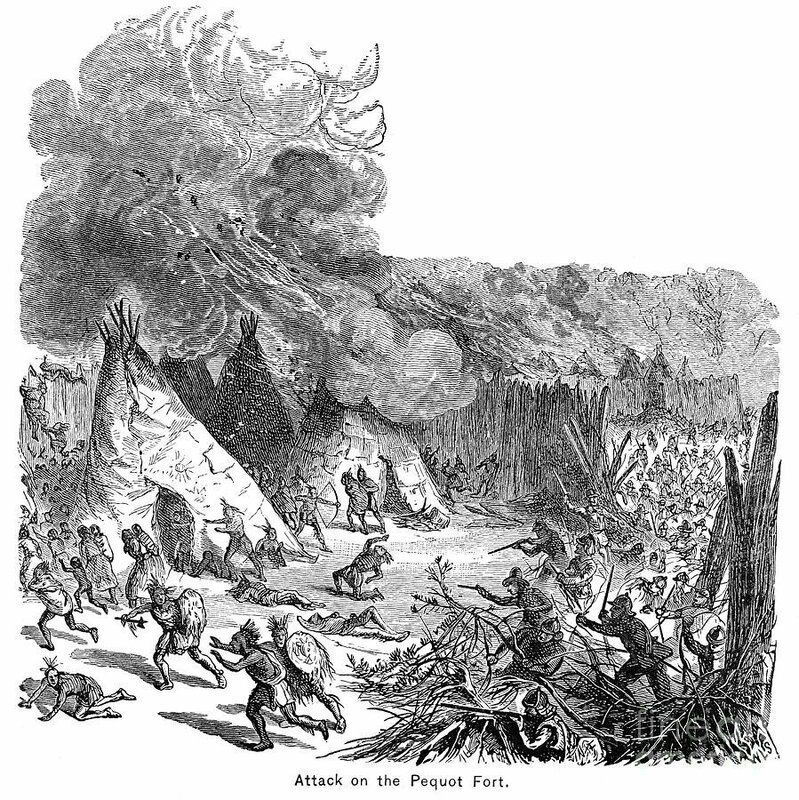 But the Pequot Nation had not agreed to the peace treaty Squanto had negotiated and they fought back. 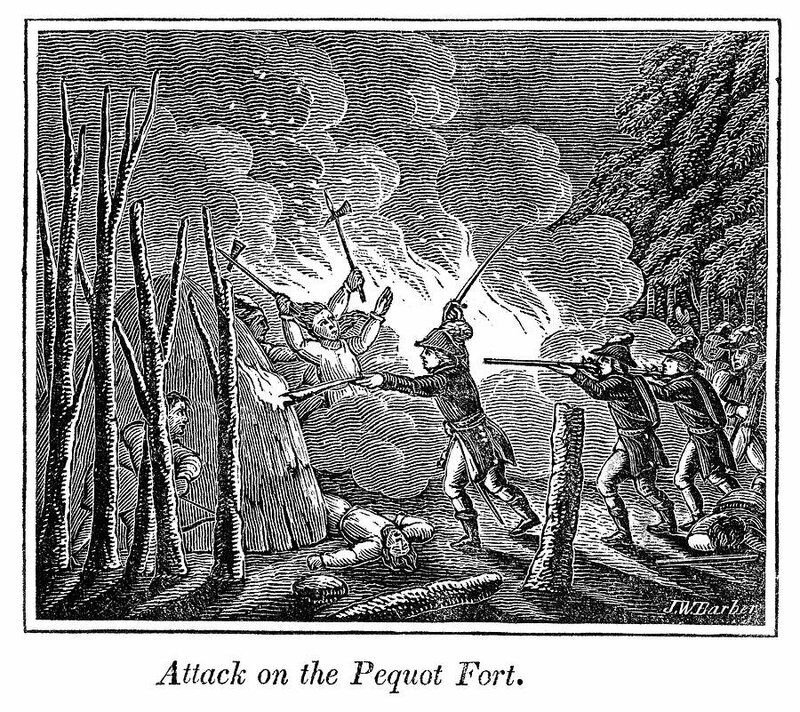 The Pequot War was one of the bloodiest Indian wars ever fought. In 1637 near present day Groton, Connecticut, over 700 men, women and children of the Pequot Tribe had gathered for their annual Green Corn Festival which is our Thanksgiving celebration. In the predawn hours the sleeping Indians were surrounded by English and Dutch mercenaries who ordered them to come outside. Those who came out were shot or clubbed to death while the terrified women and children who huddled inside the longhouse were burned alive. 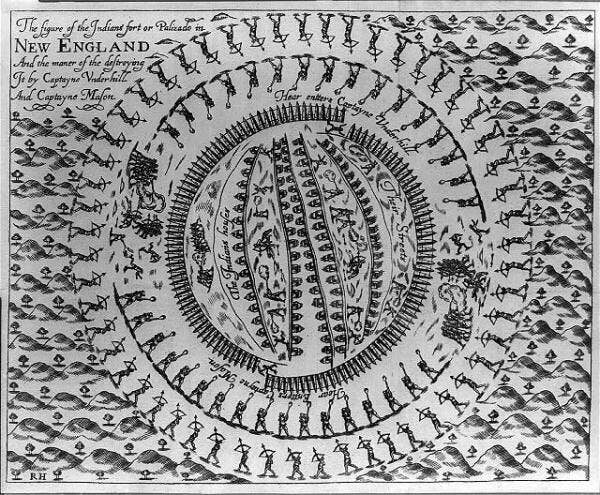 The next day the governor of the Massachusetts Bay Colony declared “A Day Of Thanksgiving” because 700 unarmed men, women and children had been murdered. 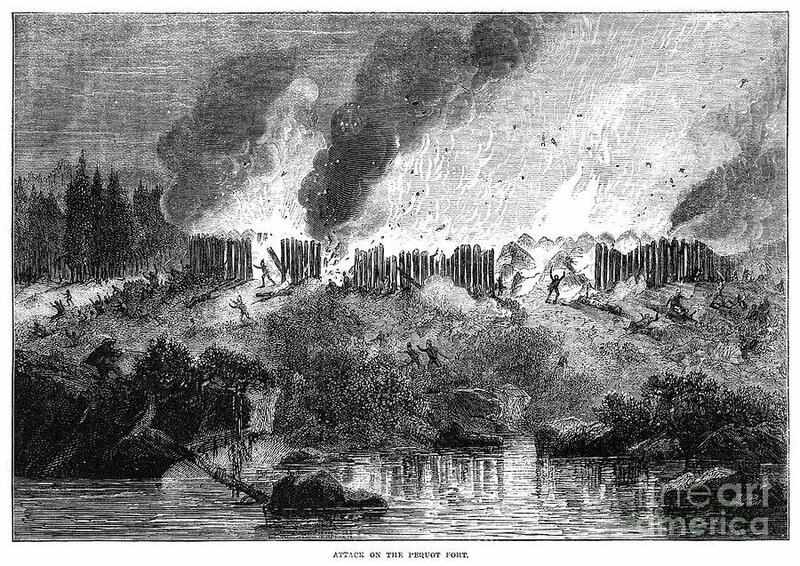 Cheered by their “victory”, the brave colonists and their Indian allies attacked village after village. Women and children over 14 were sold into slavery while the rest were murdered. Boats loaded with a many as 500 slaves regularly left the ports of New England. Bounties were paid for Indian scalps to encourage as many deaths as possible. Following an especially successful raid against the Pequot in what is now Stamford, Connecticut, the churches announced a second day of “thanksgiving” to celebrate victory over the heathen savages. During the feasting, the hacked off heads of Natives were kicked through the streets like soccer balls. Even the friendly Wampanoag did not escape the madness. Their chief was beheaded, and his head impaled on a pole in Plymouth, Massachusetts — where it remained on display for 24 years. The killings became more and more frenzied, with days of thanksgiving feasts being held after each successful massacre. George Washington finally suggested that only one day of Thanksgiving per year be set aside instead of celebrating each and every massacre. Later Abraham Lincoln decreed Thanksgiving Day to be a legal national holiday during the Civil War — on the same day he ordered troops to march against the starving Sioux in Minnesota. This story doesn’t have quite the same fuzzy feelings associated with it as the one where the Indians and Pilgrims are all sitting down together at the big feast. But we need to learn our true history so it won’t ever be repeated. Next Thanksgiving, when you gather with your loved ones to Thank God for all your blessings, think about those people who only wanted to live their lives and raise their families. They, also took time out to say “thank you” to Creator for all their blessings. This is a particularly difficult introduction to write. I have been a public schools teacher for twelve years, and I am also a historian and have written several books on American and Native American history. I also just happen to be Quebeque French, Metis, Ojibwa, and Iroquois. Because my Indian ancestors were on both sides of the struggle between the Puritans and the New England Indians and I am well versed in my cultural heritage and history both as an Anishnabeg (Algokin) and Hodenosione (Iroquois), it was felt that I could bring a unique insight to the project. For an Indian, who is also a school teacher, Thanksgiving was never an easy holiday for me to deal with in class. I sometimes have felt like I learned too much about “the Pilgrims and the Indians.” Every year I have been faced with the professional and moral dilemma of just how to be honest and informative with my children at Thanksgiving without passing on historical distortions, and racial and cultural stereotypes. The problem is that part of what you and I learned in our own childhood about the “Pilgrims” and “Squanto” and the “First Thanksgiving” is a mixture of both history and myth. But the THEME of Thanksgiving has truth and integrity far above and beyond what we and our forebearers have made of it. Thanksgiving is a bigger concept than just the story of the founding of the Plymouth Plantation. So what do we teach to our children? We usually pass on unquestioned what we all received in our own childhood classrooms. I have come to know both the truths and the myths about our “First Thanksgiving,” and I feel we need to try to reach beyond the myths to some degree of historic truth. This text is an attempt to do this. At this point you are probably asking, “What is the big deal about Thanksgiving and the Pilgrims?” “What does this guy mean by a mixture of truths and myth?” That is just what this introduction is all about. I propose that there may be a good deal that many of us do not know about our Thanksgiving holiday and also about the “First Thanksgiving” story. I also propose that what most of us have learned about the Pilgrims and the Indians who were at the first Thanksgiving at Plymouth Plantation is only part of the truth. When you build a lesson on only half of the information, then you are not teaching the whole truth. That is why I used the word myth. So where do you start to find out more about the holiday and our modern stories about how it began? 1. The Puritans were not just simple religious conservatives persecuted by the King and the Church of England for their unorthodox beliefs. They were political revolutionaries who not only intended to overthrow the government of England, but who actually did so in 1649. 3. The Pilgrims were not just innocent refugees from religious persecution. They were victims of bigotry in England, but some of them were themselves religious bigots by our modern standards. The Puritans and the Pilgrims saw themselves as the “Chosen Elect” mentioned in the book of Revelation. They strove to “purify” first themselves and then everyone else of everything they did not accept in their own interpretation of scripture. Later New England Puritans used any means, including deceptions, treachery, torture, war, and genocide to achieve that end. (4) They saw themselves as fighting a holy war against Satan, and everyone who disagreed with them was the enemy. This rigid fundamentalism was transmitted to America by the Plymouth colonists, and it sheds a very different light on the “Pilgrim” image we have of them. This is best illustrated in the written text of the Thanksgiving sermon delivered at Plymouth in 1623 by “Mather the Elder.” In it, Mather the Elder gave special thanks to God for the devastating plague of smallpox which wiped out the majority of the Wampanoag Indians who had been their benefactors. He praised God for destroying “chiefly young men and children, the very seeds of increase, thus clearing the forests to make way for a better growth”, i.e., the Pilgrims. (5) In as much as these Indians were the Pilgrim’s benefactors, and Squanto, in particular, was the instrument of their salvation that first year, how are we to interpret this apparent callousness towards their misfortune? Obviously there is a lot more to the story of Indian/Puritan relations in New England than in the thanksgiving stories we heard as children. Our contemporary mix of myth and history about the “First” Thanksgiving at Plymouth developed in the 1890s and early 1900s. Our country was desperately trying to pull together its many diverse peoples into a common national identity. To many writers and educators at the end of the last century and the beginning of this one, this also meant having a common national history. This was the era of the “melting pot” theory of social progress, and public education was a major tool for social unity. It was with this in mind that the federal government declared the last Thursday in November as the legal holiday of Thanksgiving in 1898. In consequence, what started as an inspirational bit of New England folklore, soon grew into the full-fledged American Thanksgiving we now know. It emerged complete with stereotyped Indians and stereotyped Whites, incomplete history, and a mythical significance as our “First Thanksgiving.” But was it really our FIRST American Thanksgiving? Now that I have deliberately provoked you with some new information and different opinions, please take the time to read some of the texts in our bibliography. I want to encourage you to read further and form your own opinions. There really is a TRUE Thanksgiving story of Plymouth Plantation. But I strongly suggest that there always has been a Thanksgiving story of some kind or other for as long as there have been human beings. There was also a “First” Thanksgiving in America, but it was celebrated thirty thousand years ago. (11) At some time during the New Stone Age (beginning about ten thousand years ago) Thanksgiving became associated with giving thanks to God for the harvests of the land. Thanksgiving has always been a time of people coming together, so thanks has also been offered for that gift of fellowship between us all. Every last Thursday in November we now partake in one of the OLDEST and most UNIVERSAL of human celebrations, and THERE ARE MANY THANKSGIVING STORIES TO TELL. As for Thanksgiving week at Plymouth Plantation in 1621, the friendship was guarded and not always sincere, and the peace was very soon abused. But for three days in New England’s history, peace and friendship were there. So here is a story for your children. It is as kind and gentle a balance of historic truth and positive inspiration as its writers and this editor can make it out to be. I hope it will adequately serve its purpose both for you and your students, and I also hope this work will encourage you to look both deeper and farther, for Thanksgiving is Thanksgiving all around the world. (1) See Berkhofer, Jr., R.F., “The White Man’s Indian,” references to Puritans, pp. 27, 80-85, 90, 104, & 130. (2) See Berkhofer, Jr., R.F., “The White Man’s Indian,” references to frontier concepts of savagery in index. Also see Jennings, Francis, “The Invasion of America,” the myth of savagery, pp. 6-12, 15-16, & 109-110. (3) See Blitzer, Charles, “Age of Kings,” Great Ages of Man series, references to Puritanism, pp. 141, 144 & 145-46. Also see Jennings, Francis, “The Invasion of America,” references to Puritan human motives, pp. 4-6, 43- 44 and 53. (5) See “Chronicles of American Indian Protest,” pp. 6-9. Also see Berkhofer, Jr., R.F., “The White Man’s Indian,” the comments of Cotton Mather, pp. 37 & 82-83. (6) See Larsen, Charles M., “The Real Thanksgiving,” pp. 3-4. Also see Graff, Steward and Polly Ann, “Squanto, Indian Adventurer.” Also see “Handbook of North American Indians,” Vol. 15, the reference to Squanto on p. 82. (7) See Benton-Banai, Edward, “The Mishomis Book,” as a reference on general “Anishinabe” (the Algonkin speaking peoples) religious beliefs and practices. Also see Larsen, Charles M., “The Real Thanksgiving,” reference to religious life on p. 1. (9) See Larsen, Charles M., “The Real Thanksgiving,” the letter of Edward Winslow dated 1622, pp. 5-6. (11) Best current estimate of the first entry of people into the Americas confirmed by archaeological evidence that is datable. 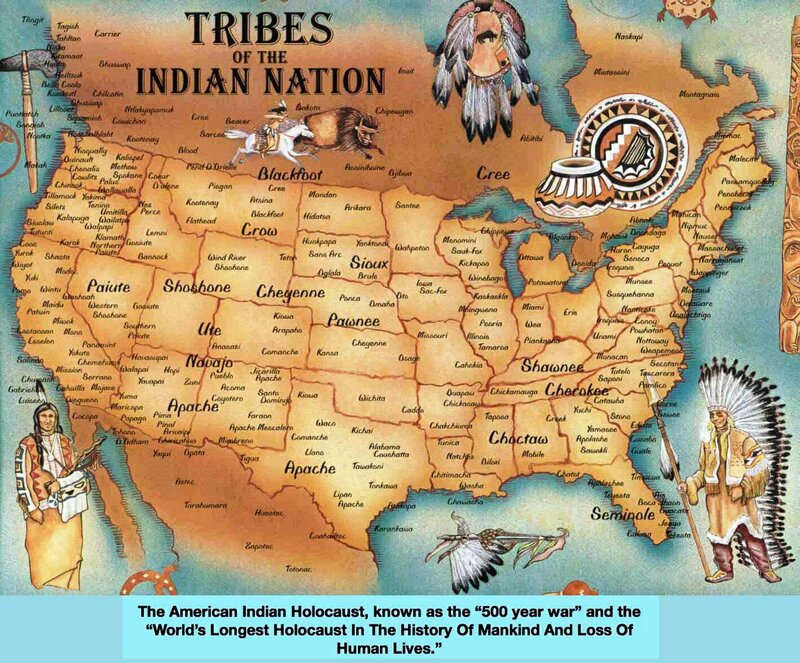 When the Pilgrims crossed the Atlantic Ocean in 1620, they landed on the rocky shores of a territory that was inhabited by the Wampanoag (Wam pa NO ag) Indians. The Wampanoags were part of the Algonkian-speaking peoples, a large group that was part of the Woodland Culture area. These Indians lived in villages along the coast of what is now Massachusetts and Rhode Island. They lived in round- roofed houses called wigwams. These were made of poles covered with flat sheets of elm or birch bark. Wigwams differ in construction from tipis that were used by Indians of the Great Plains. The Wampanoags moved several times during each year in order to get food. In the spring they would fish in the rivers for salmon and herring. In the planting season they moved to the forest to hunt deer and other animals. After the end of the hunting season people moved inland where there was greater protection from the weather. From December to April they lived on food that they stored during the earlier months. The basic dress for men was the breech clout, a length of deerskin looped over a belt in back and in front. Women wore deerskin wrap-around skirts. Deerskin leggings and fur capes made from deer, beaver, otter, and bear skins gave protection during the colder seasons, and deerskin moccasins were worn on the feet. Both men and women usually braided their hair and a single feather was often worn in the back of the hair by men. They did not have the large feathered headdresses worn by people in the Plains Culture area. There were two language groups of Indians in New England at this time. The Iroquois were neighbors to the Algonkian-speaking people. Leaders of the Algonquin and Iroquois people were called “sachems” (SAY chems). Each village had its own sachem and tribal council. Political power flowed upward from the people. Any individual, man or woman, could participate, but among the Algonquins more political power was held by men. Among the Iroquois, however, women held the deciding vote in the final selection of who would represent the group. Both men and women enforced the laws of the village and helped solve problems. The details of their democratic system were so impressive that about 150 years later Benjamin Franklin invited the Iroquois to Albany, New York, to explain their system to a delegation who then developed the “Albany Plan of Union.” This document later served as a model for the Articles of Confederation and the Constitution of the United States. These Indians of the Eastern Woodlands called the turtle, the deer and the fish their brothers. They respected the forest and everything in it as equals. Whenever a hunter made a kill, he was careful to leave behind some bones or meat as a spiritual offering, to help other animals survive. Not to do so would be considered greedy. The Wampanoags also treated each other with respect. Any visitor to a Wampanoag home was provided with a share of whatever food the family had, even if the supply was low. This same courtesy was extended to the Pilgrims when they met. We can only guess what the Wampanoags must have thought when they first saw the strange ships of the Pilgrims arriving on their shores. But their custom was to help visitors, and they treated the newcomers with courtesy. It was mainly because of their kindness that the Pilgrims survived at all. The wheat the Pilgrims had brought with them to plant would not grow in the rocky soil. They needed to learn new ways for a new world, and the man who came to help them was called “Tisquantum” (Tis SKWAN tum) or “Squanto” (SKWAN toe). Squanto was originally from the village of Patuxet (Pa TUK et) and a member of the Pokanokit Wampanoag nation. Patuxet once stood on the exact site where the Pilgrims built Plymouth. In 1605, fifteen years before the Pilgrims came, Squanto went to England with a friendly English explorer named John Weymouth. He had many adventures and learned to speak English. Squanto came back to New England with Captain Weymouth. Later Squanto was captured by a British slaver who raided the village and sold Squanto to the Spanish in the Caribbean Islands. A Spanish Franciscan priest befriended Squanto and helped him to get to Spain and later on a ship to England. Squanto then found Captain Weymouth, who paid his way back to his homeland. In England Squanto met Samoset of the Wabanake (Wab NAH key) Tribe, who had also left his native home with an English explorer. They both returned together to Patuxet in 1620. When they arrived, the village was deserted and there were skeletons everywhere. Everyone in the village had died from an illness the English slavers had left behind. Squanto and Samoset went to stay with a neighboring village of Wampanoags. One year later, in the spring, Squanto and Samoset were hunting along the beach near Patuxet. They were startled to see people from England in their deserted village. For several days, they stayed nearby observing the newcomers. Finally they decided to approach them. Samoset walked into the village and said “welcome,” Squanto soon joined him. The Pilgrims were very surprised to meet two Indians who spoke English. The Pilgrims were not in good condition. They were living in dirt-covered shelters, there was a shortage of food, and nearly half of them had died during the winter. They obviously needed help and the two men were a welcome sight. Squanto, who probably knew more English than any other Indian in North America at that time, decided to stay with the Pilgrims for the next few months and teach them how to survive in this new place. He brought them deer meat and beaver skins. He taught them how to cultivate corn and other new vegetables and how to build Indian-style houses. He pointed out poisonous plants and showed how other plants could be used as medicine. He explained how to dig and cook clams, how to get sap from the maple trees, use fish for fertilizer, and dozens of other skills needed for their survival. By the time fall arrived things were going much better for the Pilgrims, thanks to the help they had received. The corn they planted had grown well. There was enough food to last the winter. They were living comfortably in their Indian-style wigwams and had also managed to build one European-style building out of squared logs. This was their church. They were now in better health, and they knew more about surviving in this new land. The Pilgrims decided to have a thanksgiving feast to celebrate their good fortune. They had observed thanksgiving feasts in November as religious obligations in England for many years before coming to the New World. The Algonkian tribes held six thanksgiving festivals during the year. The beginning of the Algonkian year was marked by the Maple Dance which gave thanks to the Creator for the maple tree and its syrup. This ceremony occurred when the weather was warm enough for the sap to run in the maple trees, sometimes as early as February. Second was the planting feast, where the seeds were blessed. The strawberry festival was next, celebrating the first fruits of the season. Summer brought the green corn festival to give thanks for the ripening corn. In late fall, the harvest festival gave thanks for the food they had grown. Mid-winter was the last ceremony of the old year. When the Indians sat down to the “first Thanksgiving” with the Pilgrims, it was really the fifth thanksgiving of the year for them! Captain Miles Standish, the leader of the Pilgrims, invited Squanto, Samoset, Massasoit (the leader of the Wampanoags), and their immediate families to join them for a celebration, but they had no idea how big Indian families could be. As the Thanksgiving feast began, the Pilgrims were overwhelmed at the large turnout of ninety relatives that Squanto and Samoset brought with them. The Pilgrims were not prepared to feed a gathering of people that large for three days. Seeing this, Massasoit gave orders to his men within the first hour of his arrival to go home and get more food. Thus it happened that the Indians supplied the majority of the food: Five deer, many wild turkeys, fish, beans, squash, corn soup, corn bread, and berries. Captain Standish sat at one end of a long table and the Clan Chief Massasoit sat at the other end. For the first time the Wampanoag people were sitting at a table to eat instead of on mats or furs spread on the ground. The Indian women sat together with the Indian men to eat. The Pilgrim women, however, stood quietly behind the table and waited until after their men had eaten, since that was their custom. For three days the Wampanoags feasted with the Pilgrims. It was a special time of friendship between two very different groups of people. A peace and friendship agreement was made between Massasoit and Miles Standish giving the Pilgrims the clearing in the forest where the old Patuxet village once stood to build their new town of Plymouth. It would be very good to say that this friendship lasted a long time; but, unfortunately, that was not to be. More English people came to America, and they were not in need of help from the Indians as were the original Pilgrims. Many of the newcomers forgot the help the Indians had given them. Mistrust started to grow and the friendship weakened. The Pilgrims started telling their Indian neighbors that their Indian religion and Indian customs were wrong. The Pilgrims displayed an intolerance toward the Indian religion similar to the intolerance displayed toward the less popular religions in Europe. The relationship deteriorated and within a few years the children of the people who ate together at the first Thanksgiving were killing one another in what came to be called King Phillip’s War. It is sad to think that this happened, but it is important to understand all of the story and not just the happy part. Today the town of Plymouth Rock has a Thanksgiving ceremony each year in remembrance of the first Thanksgiving. 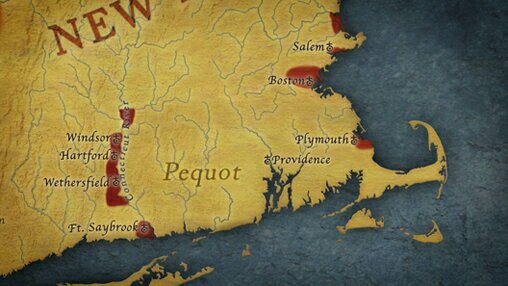 There are still Wampanoag people living in Massachusetts. In 1970, they asked one of them to speak at the ceremony to mark the 350th anniversary of the Pilgrim’s arrival. Here is part of what was said: Frank James speech was written but was suppressed and he did not speak at the ceremony.